I have no idea why, but when warm weather rolls around, I eat a lot of fun grains/seeds in cold salad form. So simple, refreshing, and healthy. Just this week alone, wheat berries, farro, couscous, and quinoa have made their appearance at my table. While I love the diversity, Mr. Prevention resists the unknown. This salad, for example, he wouldn’t even try (!). Dietitians…we go nuts for things like this. Nearly every last calorie in this salad is “well spent” on healthy fats, omega 3’s, fiber, and loads of nutrients. Donna stopped over one night last week after her daughter’s flight was delayed and we swooned over this salad and all of its great textures and flavors. Bonus: goat cheese seems to be very “in” right now (I love how food goes through phases of popularity like most anything else) and whether it’s “in” or not…I am a goat cheese lover. Even though Mr. Prevention refuses trying (some) new things, he did have a great idea yesterday. Before the afternoon heat set in, we went out biking in the country, per Mr. Prevention’s suggestion. This Chicago born and bred girl loves the country being so close by…and I don’t take advantage as much as I should. Once we had gotten about 5 miles from out house, we passed this HUGE pack of serious bikers. They all had road bikes, helmets, clip-in shoes, onesie spandex outfits in bright colors, and no morning exerciser “hellos”. All business they were. Mr. P and I busted up laughing as they zoomed by us in our mountain bikes (Mr. P shirtless, me in plain’ol workout clothes) and we turned our bikes around, joking that we would tag along. Yield: ~10 servings (1/2 cup each). Result: I ADORE this dressing. It would go great on just about anything. The celery was a nice surprise with the crunch to perfectly balance the creamy and smooth goat cheese. The cranberries added that sweetness (along with the maple syrup). 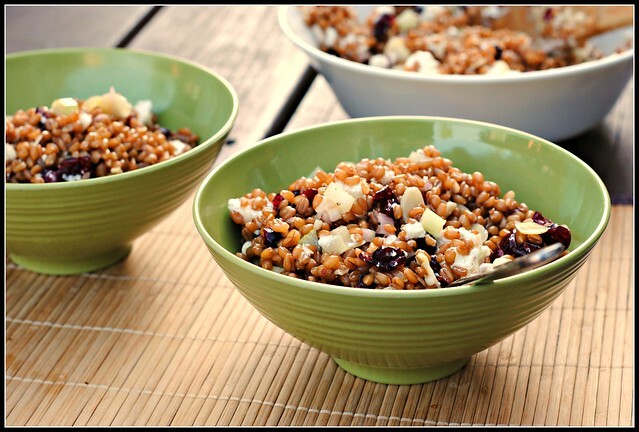 The wheat berries are hearty and chewy. This is definitely one of the best cold salads I’ve ever made and I love that any grain could be swapped in for wheat berries (i.e. barley, farro, bulgar, etc.). Enjoy! Monday, fun day! It’s supposed to be another hot day in central Ohio. My tomatoes and zucchini are growing like CRAZY! I will have to post updated pictures soon — they’ve more than doubled in size. Maybe even tripled! I am hooked on Fifty Shades of Grey like every other woman out there, it seems. Tonight I will have to catch up on the grading I didn’t do this weekend…oops. Two more weeks til the quarter is over…zooming by! That used to be me and my family, riding our bikes to Der Dutchman on Sunday mornings! We didn’t go real fast, but we always biked about 35 miles, total. Those were fun days. I love biking! 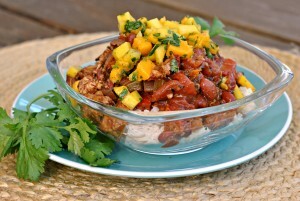 This recipe would have been perfect when I Was searching endlessly for wheat berry recipes for Mother’s Day. Darnit! I’ll still save it though, it sounds wonderful. Nick doesn’t go for goat cheese, but I think I’ll make this for myself! I’ve heard a lot about that book – I’ll have to check it out! I just want to tell you I am really enjoying your blog, and you are opening my eyes to all kinds of different food ideas while I endeavor to lose a whole bunch of weight. I’ve never even heard of wheat berries…is this something Wal-Mart or Kroger’s would carry? Would I find them maybe in the health food section? Near the rice? I’d love to try it, though, so I’m going to search! P.S. Also, you have two amounts listed for fiber in the nutrition breakdown. I’m assuming one of them should be the protein amount. Thank you so much, Melanie! I really appreciate it 🙂 Wheat berries are something you can (usually) find in the health foods section of Walmart or Kroger. I know my Kroger carries them (the Bob’s Red Mill brand) and my Kroger is small. And good catch on the nutrition info – I just changed it! 🙂 All my best! Me again. Also, since probably none of the rest of my family will eat this, does the dressing make the wheat berries soggy after a day or three in the fridge? Maybe they don’t get too soggy? The wheat berries will absorb most of the dressing, but I ate on this for 4-5 days and they never got soggy! The wheat berries have this unique chunchy/chewy texture that I personally love! I too like trying new things but not sure that my husband would try this recipe either. Funny about 50 Shades of Grey; I think my book club will be reading it next month. Loves me some goat cheese! The hubs though? Not a fan! I must have been living under a rock because I’ve just heard of 50 Shades of Grey and in the last couple days its everywhere! Oooh, I had completely forgotten how much I love wheat berries! 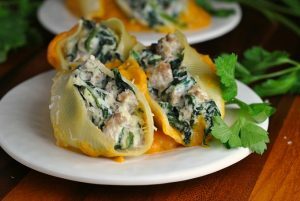 Their texture is amazing and they are incredibly filling! I need to cook some up soon! 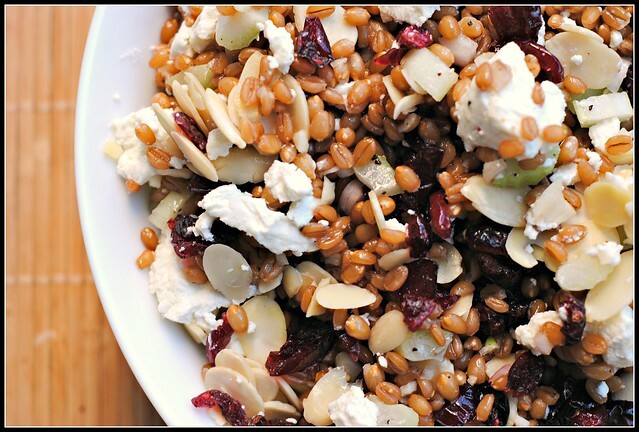 I definitely love cold grain salads in the summer too 🙂 I’ve never tried wheat berries before, but the cranberries and goat cheese in here is one of my favorites! So I made this and it is tasty but mine doesn’t look like yours at all – my wheat berries are way bigger a d they absorbed almost all the water during cooking – did I do something wrong? Claire: Ah! Sorry! I thought I responded but it would appear I forgot. I think wheat berries can vary a bit in side. Were they still chewy? They do absorb a lot of water and once the dressing is on…they abosorb that, too. I would say the salad is best the first 2 days, but it kept well for about 5. I hope it was still enjoyable! 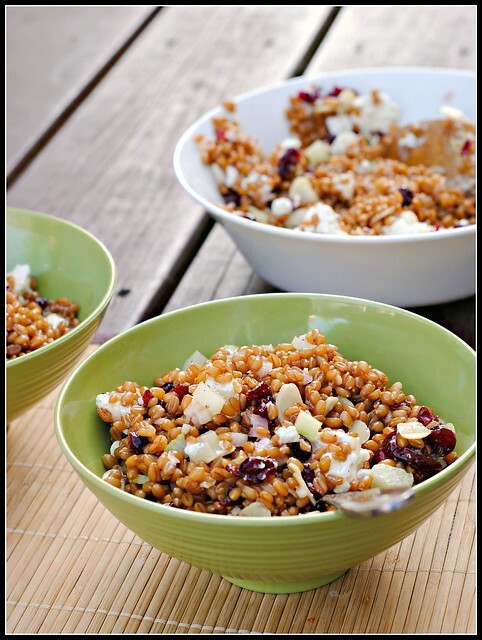 You can certainly try with farro, barley, etc! Mmm! I literally just made my first batch of wheat berries ever two nights ago. I loved the chewy texture! I put mine into a cold salad too, which should be up on my blog today! Thank you for this lovely looking recipe! I love these kind of salads. I have had wheat Berry salad before at local Harris Teeter and Earth Fare and wanted to make it because it was so great. I have been hooked on Taboule Salad and I needed a new salad that had good protein and either feta or goat cheese in it. I am going to make it tonight for dinner. I will let you all know how it comes out. This is the first time I have blogged so I am excited about it too. I will let you know if I make any additions or changes to this salad. I have a tendency to modify most recipes. So here goes……..